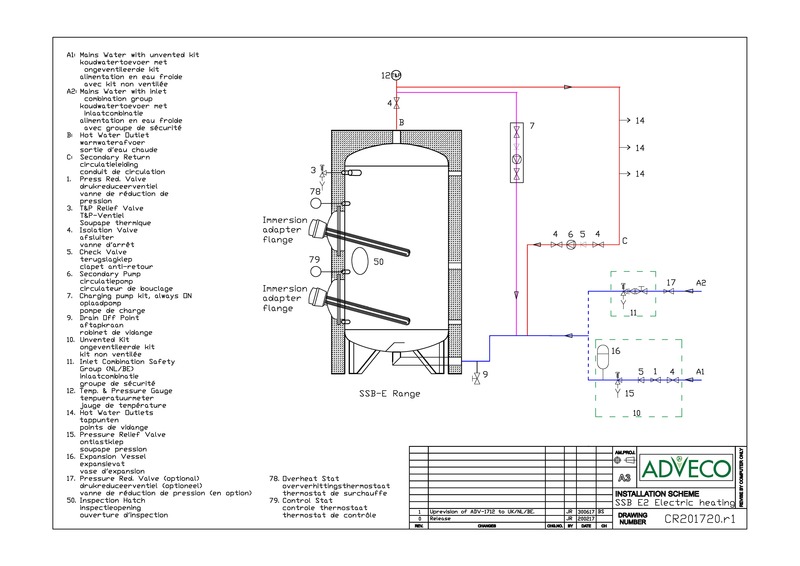 The Adveco range of stainless steel domestic hot water tanks is constructed from high-grade AISI 316L austenitic stainless steel and includes models from 200 to 2500 litres. The stainless steel range is suitable for use as hot water buffers, single coil, or dual coil calorifiers as required for the application. The range consists of three types of vessel, differentiated by the number of internal heat exchange coils included as standard. The Stainless Steel Buffer (SSB) range serves as buffer vessels only, and are supplied with two blank flanges without any internal heat exchange coils. 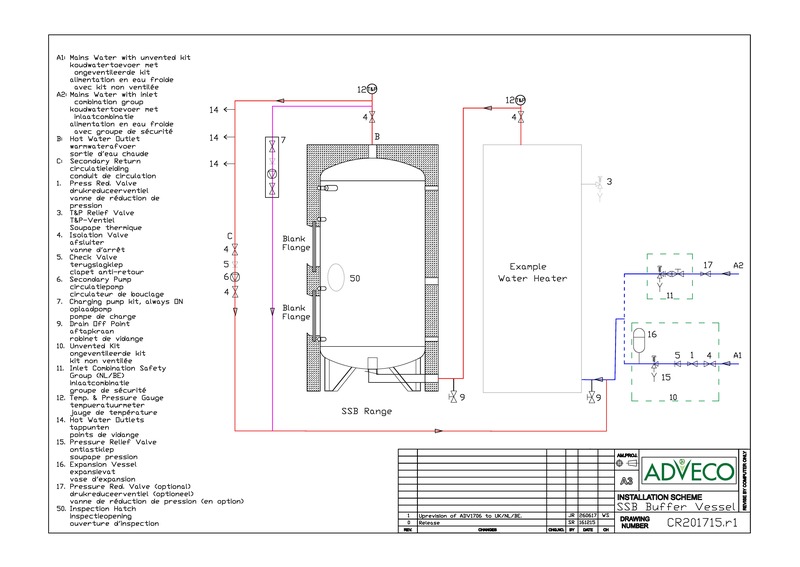 The SSB range can be used to expand the dump load capacity of a water heating installation. The Stainless Steel Indirect (SSI) range is supplied with a single high-output internal heat exchange coil at low level to serve as an indirect calorifier in DHW installations. The Stainless Steel Twin-Coil (SST) range is supplied with a pair of independent internal heat exchange coils to serve domestic hot water systems. Each high-output coil can be used with a separate heat source, enabling effective integration of renewable technologies or multiple heat sources, or alternatively can be combined to increase the heat transfer capacity from a single high-output source. 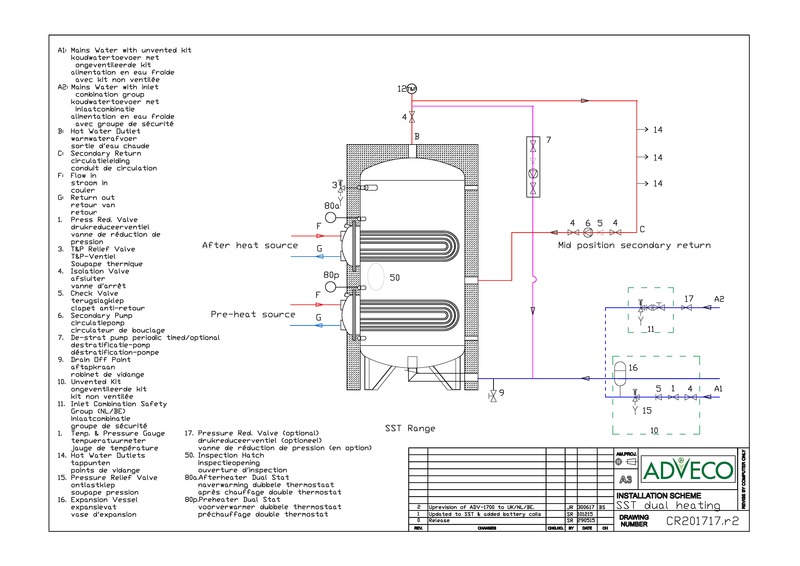 By adding specialised flanges instead of blanks, two subtypes of the SSB buffer vessel are also available: The SSB-E Electric water heater, and the SSB-D direct buffer. Stainless Steel Buffer Electric (SSB-E): One to two element mounting flanges can be used to house up to four primary immersion heaters in addition to the aforementioned backup immersion heater, delivering electrical heating outputs of up to 84 kW with inbuilt redundancy. Stainless Steel Buffer Direct (SSB-D): By using a specialised flange in the lower port of the SSB, direct large bore flow and return connections can be made to a water heater. 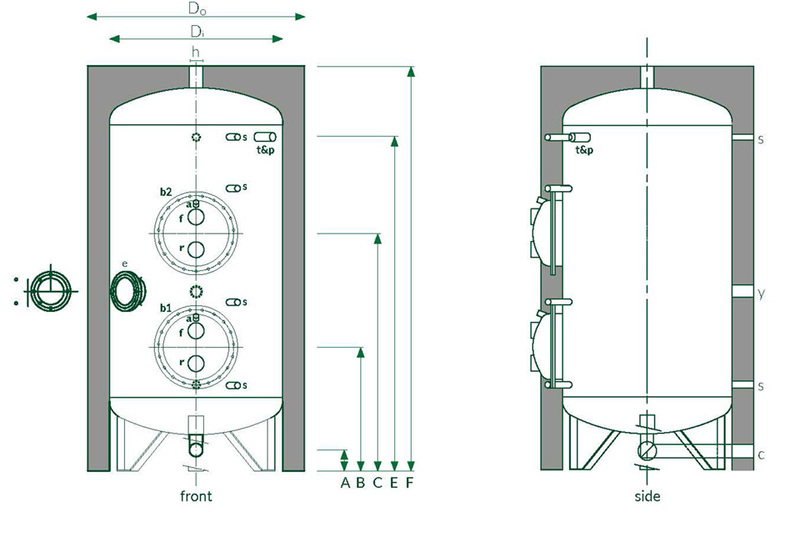 Further information relating to each specific range of stainless steel vessel can be found in the associated product data sheet. All coils and flanges featured within the stainless steel range can be removed for ease of cleaning, maintenance, and replacement. 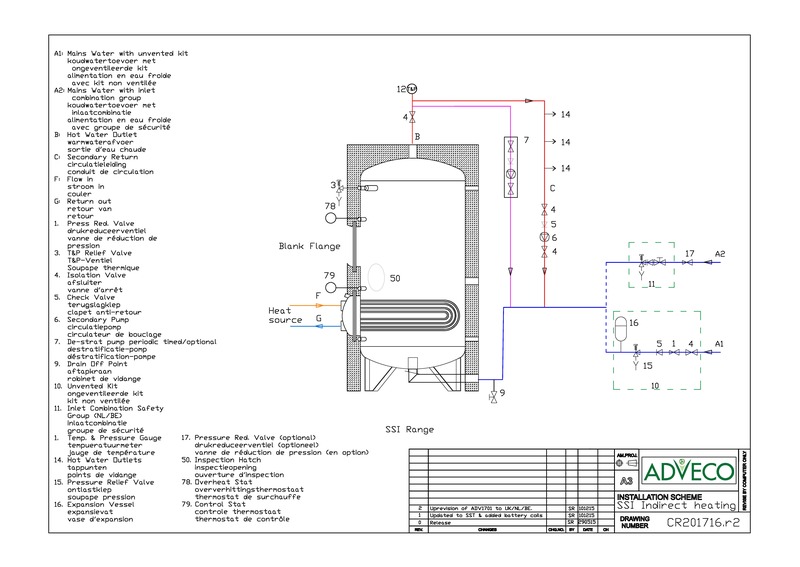 Multiple sizes and capacities of coils are available, enabling Adveco Ltd. to design a tank to fit the DHW demand or available boiler output of a building. 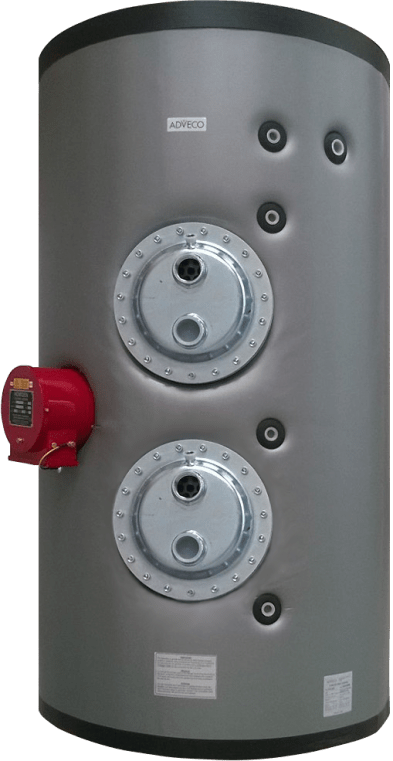 An additional mid-level side opening is included on each tank, which can optionally be supplied with an extra immersion heater to provide a level of redundancy to a water heating installation. The complete range of SSB, SSI, and SST vessels are WRAS approved, are designed and manufactured to the requirements of the Pressure Equipment Directive (97/23/EC), and are tested to the procedure defined in BS EN 12897:2006.